There’s been talk lately about the Content Bubble — the problem of excessive content on the internet. I’m inclined to agree. I think that removing all the spammy websites and most of the abandoned blogs would be a step forward for the internet. But I was reading a blog that had a different take on the whole issue. The author was pointing out that dentists are being advised to have blogs for patient education and suggesting that this would lead to problems. “How many blog posts on how to floss do we need?” he asked. He’s asking the wrong question. 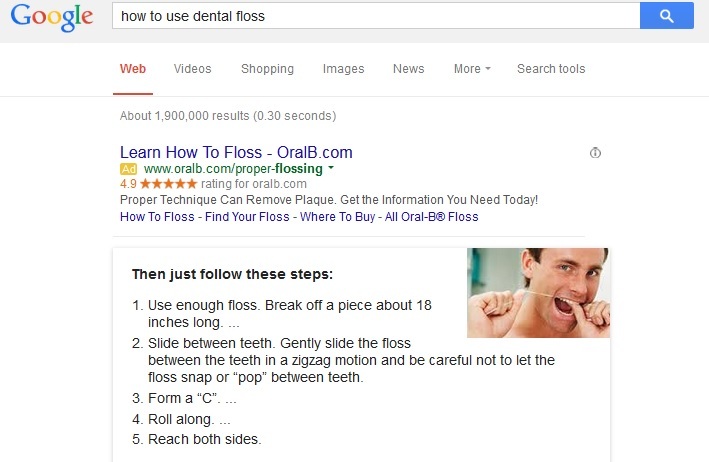 The writer of that blog post seems to have been imagining that people who don’t know how to use dental floss correctly will just go to Google and ask. A single great blog post on the subject would be plenty, if that were how it worked. In fact, as you can see from the screenshot below, you don’t even need one blog post, because Google is sharing basic instructions right there on the search engine results page. And yet dentists and dental hygienists (not to mention teachers, parents, and a wide variety of other people) have to explain this to people every day. Do we know we should eat vegetables? I blog for a consortium of doctors. In the course of researching dreadful diseases for this blog — each dreadful disease has its special observance day, week, or month and you don’t want to skip any — I have noticed that eating vegetables is recommended as a way to avoid almost every single one. I think a search for the word “vegetables” at that blog would bring up more than half of the posts. So here’s another question for you. Do you think that the average American is aware that eating vegetables is a healthy thing to do? I think we all kind of know that. And yet the average American gets just one third of the recommended number of servings. Only about one quarter of us eat as many veggies as health professionals say we should. It’s not because the information isn’t out there. We need to see some information a lot of times before we take action. Besides, people go online for health information in droves, but then many of them go to ask their doctors. They want authoritative information from someone they trust. For health professionals, it’s a great help to be able to answer those common questions and also provide a link to a blog post that gives patients the full story. Patient education can quite literally save lives. Blog posts that get essential information to your patients effectively are extremely valuable. You might not be in the business of saving lives. Your blog posts might be more about buying your water bottles instead of your competitor’s water bottles. Does that mean that your blog posts about hydration are pointless? By no means. Every web searcher sees different results. Your post may not be the top result at Google for me, but it may be the one your customer sees. Your social media sharing of information about those water bottles might be the final push someone needs toward keeping hydrated. And they might be the thing that causes your web visitor to place that order. Yes, there are something like 17 million pieces of information about flossing on the web. But your visitors are not looking at the web. They’re looking at your website. Give them something valuable to read, without assuming that they should already have looked elsewhere.